Get GOOSEBUMPS! It’s a musical! Imagine that! The play is just that awesome! Check out these deets. John Maclay, co-writer of the play NANCY DREW AND HER BIGGEST CASE EVER, delivers a show full of quick-witted humor and just a little spookiness. Together, Maclay and Abosch, bring you an exhilarating mystery with a surprising twist. Our story centers on two best friends starring in their school’s play – The Phantom. The script used in the school production is supposedly cursed. What on earth could go wrong?! A quirky theater teacher, a creepy janitor, and a jealous understudy round out GOOSEBUMPS’ endearing cast. The experience will be frighteningly fun for all! The haphazard detective work of Scooby Doo meets the witty banter of Glee in this frighteningly fun musical based on the beloved Goosebumps series. Brooke and Zeke are starring in their school play…The Phantom. (Yep-it’s a spoof of the Broadway musical!) When strange things start to happen during rehearsals, no one is sure if it’s a practical joke or if the school’s theater is haunted. Wear your favorite costume and bring the entire family to this silly, and only a little spooky, adventure. 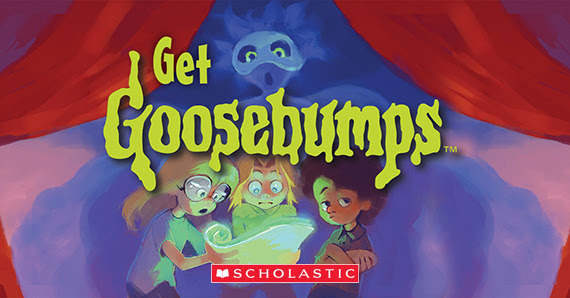 ™ & © Scholastic Inc. SCHOLASTIC, GOOSEBUMPS and associated logos are trademarks and/or registered marks of Scholastic Inc. Based on Goosebumps® Phantom of the Auditorium.